RICS Qualified Director Involvement Throughout. Wetherby based ale provider Beer Hawk has secured a 10-year lease on a Leeds warehouse to support its further growth. 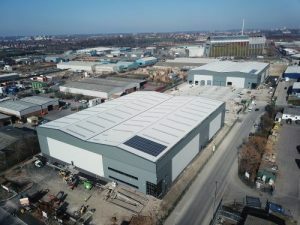 The firm has taken 62,500 sq ft of a newly constructed unit which is part of the phase one development at Towngate Link in Leeds. Established seven years ago, Beer Hawk was formed by its co-founders Mark Roberts and Chris France, with the aim of offering speciality bottled ales from artisan breweries all over the world – from Germany and New Zealand to Belgium and Norway. Beer Hawk will greatly benefit from the newly constructed warehouse, which includes a working height of 12 metres, two-storey grade A office accommodation – with the option to install a further floor – and a large 40-metre-deep secure concrete yard. Towngate was represented by partner at Knight Frank, Iain McPhail and director at Gent Visick, Paul Mack. Beer Hawk was represented by Owen Holder of Holder & Co. Registered in England No 0887385. "LeedsSkyline2013" by Lad 2011 - Own work. Licensed under CC BY-SA 3.0 via Wikimedia Commons.